This is beautiful; these are very cool. But I’m not hip enough to know what they are. Sorry. Signed “hip-less in the Okanagan”. Cool shot though. Looking forward to the reveal. No lava lamps in lotus land?? Say it isn’t so! That is a beautiful beautiful story, Carin, and I love your bio too. You used to see some of these around when I was a kid — but I guess they were more of a 60s thing? Are they called lava lamps? What an interesting shot — the three of them, such different colours and shapes, in a row like this. And their brightness set against the neutral back wall. They really are mesmerizing to watch, as I recall — why’d they ever go out of style, I wonder. Where did you spot these ones? This was taken at a local coffee shop. 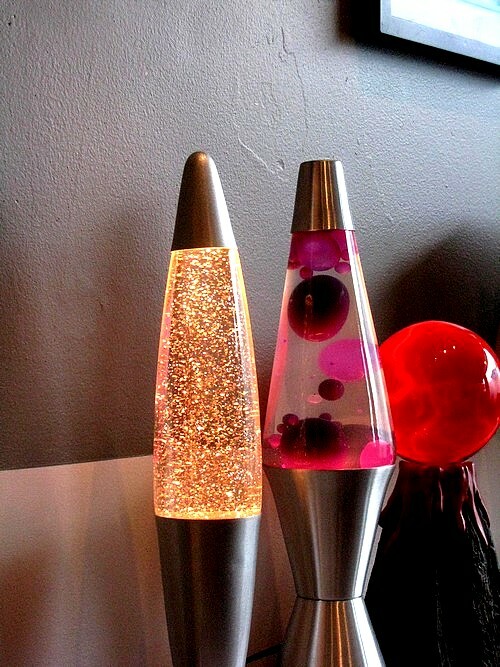 Lava lamps :) I had several of these back in the late 70’s early 80’s. I have noticed that they’re making a comeback. Lava Lamps making a big comeback, or maybe they never really left. I love the one with the moving coloured blobs best … reminds me of another chapter, way back! Ok, I remember these from the first time out – so rub it in! I never had one but loved going to friend’s places that were cool enough to have them. Nice colours! I didn’t have one either, Allison. Although we did have a fake fireplace my dad made out of a revolving cylinder of aluminium foil, back-lit with a red lightbulb. Beat that, lava lamp! Is the one on the right the kind that has lightening swirls in it that will attach to the glass under your fingertips when touched? Lighting can be exciting! I sense a fellow lover of storms…!